If you’re not a fan of celebrating Halloween but LOVE the look and feel of the season, Angela Dodson is going to help you create a calming ambience in your home this autumn with this beautiful pumpkin tea light holder. 1. 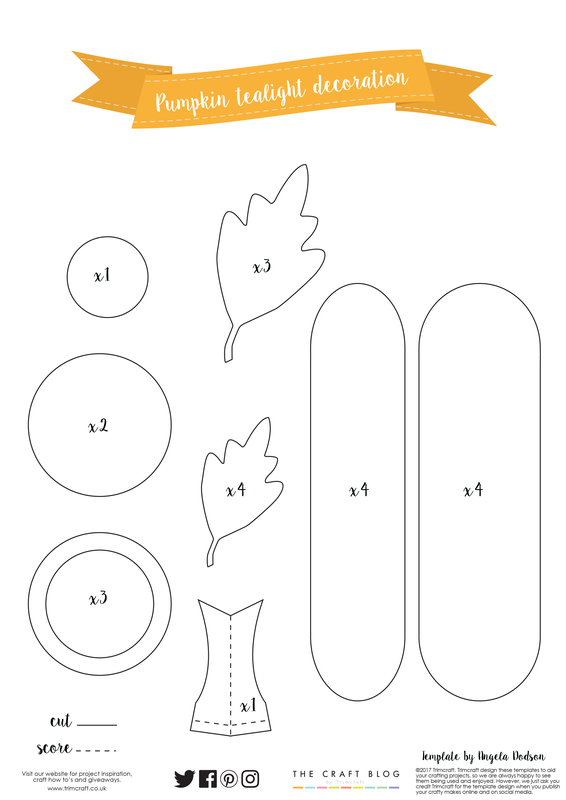 Download, print and cut the pieces out from the free template. 2. Following the printable, cut out the rectangular pieces onto Dovecraft orange A4 card, the leaves and smaller circle onto green card, the larger circles and the stalk shape out of Dovecraft Kraft card. 3. Stamp the Dovecraft Candy Skull stamp design randomly across your strips of orange card using Dovecraft Embossing Ink. Sprinkle the WOW! Gold Embossing Powder on top and heat set. Pierce a hole in the top of each strip and ink around the edges if desired with a Dovecraft light brown ink pad. 4. Take your widest orange strips (embossed side down) and glue the ends equally spaced around one of your largest kraft card circles, then attach the other 4 strips in the spaces between. Next, glue one of the largest circle kraft card circles in the middle of your strips and layer 3 kraft card rings on top with glue to hold the tea light in place. 5. Push a brad or split pin through one of the large orange strips from behind and then through each of the strips in turn working around the shape, leave one small strip unattached, this will be the ‘door’ of the holder. Glue the green circle card and large leaves to the top. 6. 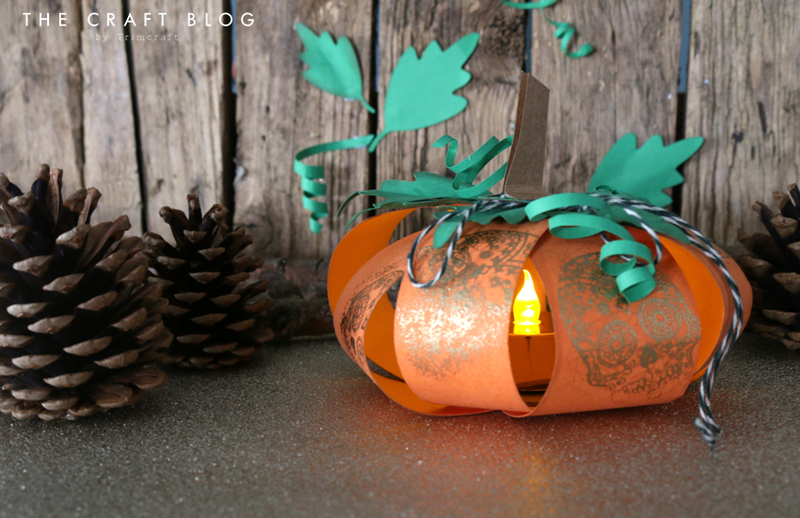 Glue the smaller leaves to the top of the pumpkin, cut strips of green card, twirl and glue to decorate the top. Pierce a hole in the small green circle and push the ‘legs’ of the brad through it, bend them to secure the top in place. 7. Hide the brad by adding your kraft card stalk to the top with glue. Thread a length of Dovecraft Twine through the hole on the door of your tea light holder. Pop a battery operated tea light inside the pumpkin, close the door and secure it by tying the twine in a bow. Only use a battery operated candle for this project. How will you use Angela’s template and pumpkin design? We’d LOVE to see your versions so don’t forget to #trimcraft when uploading to social media and to share your projects in the Inspiration area. If you’d like to see more of Angela’s gorgeous crafts, definitely check out her blog and social media pages!